I hate to waste stuff, especially oil, so I always try to find another use for stuff that is considered waste. Here in Greece we often use Olive oil for frying and since my husband loves fried potatoes, there's a lot of frying going on in our kitchen and I always feel uneasy about discarding it after use. I mean, what do you do with it once you have fried those potatoes? Do you dump it in the sink? That doesn't seam like a good idea. Dump it in the garbage? More likely, but how? Some people pour it into plastic bottles before dumping it. 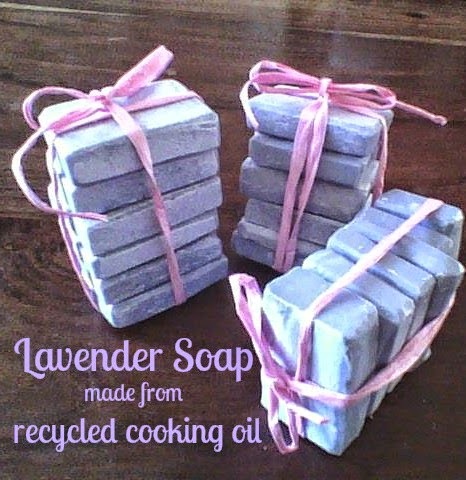 I didn't feel good about any of those options, and I wanted to find a way to reuse it, but not for making body soap, because I like to use clean Olive oil for that (even though I know some companies recycle waste oil and make soaps for hands and body). There is a company here in Greece that recycles oils and trades them for laundry detergent or soaps and they pass by my house sometimes, but not regularly and I still haven't pinpointed their schedule. So I figured I'll just save the oil in a plastic bucket and think of something. Not long after, I gathered about 1 kg of oil. 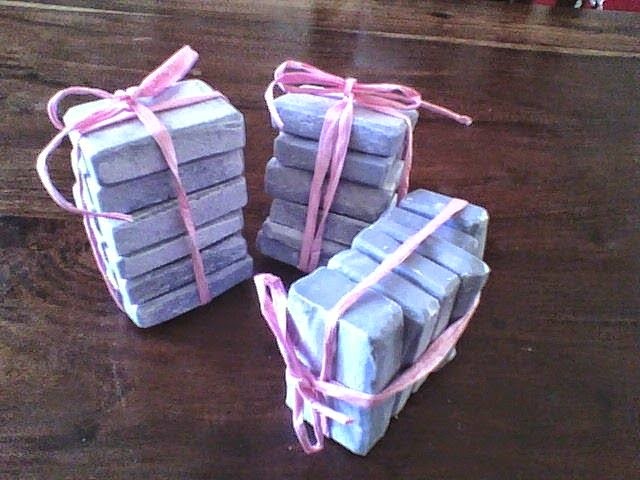 I decided to make some lavender scented soaps for the closets as lavender is supposed to protect clothes from mothes (this rhymes...) and it smells great so it should keep your linen and clothes fresh. First I strained the oil in a plastic 1.5 l bottle. Then, as per advice of Prof. Zoran Vujic, soap enthusiast who is a Prof. of Chemistry at the University in Belgrade, I added 0.2 l of tap water to it, shaken it a bit, turned it upside down and left it overnight. This step is supposed to remove water soluble aldehydes. Next time I will probably just filter the oil through sieve and some kitchen paper, since this soap is not meant for personal use, it should make no difference. Anyway, after finally separating the oil and water it was time to make some soap. The soap turned out OK, although it hardened very quickly. I should have taken it out of the mold sooner, maybe after 8 hours. 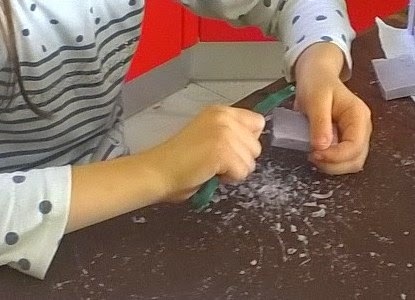 It was al ittle hard to cut, but I had help from my daughter - I cut it, she processed the edges. That's it. My clothes smell great now and I gave some of these to my friend and my mother in law as well. I am saving the used oil again and once I have enough I will definitely make some more. It's really a good feeling when you make something useful from something that was considered waste.